Medicare is a federal program, managed by the Centers for Medicare & Medicaid Services (CMS), that provides health insurance to eligible United States citizens and legal permanent residents of five or more continuous years. You’re eligible for Medicare if you’re 65 or older or under 65 through disability. You may also qualify for Medicare at any age if you have end-stage renal disease requiring dialysis or a kidney transplant, or amyotrophic lateral sclerosis (also known as Lou Gehrig’s disease). Medicare beneficiaries can generally get their health coverage in two ways: through Original Medicare, the government-run program; or through a Medicare Advantage plan, offered through Medicare-contracted private insurance companies. Part A covers inpatient hospital, skilled nursing facility, hospice, and eligible home health care. Part A-covered hospital services include medically necessary services and equipment to treat your condition. Part B covers medically necessary outpatient services, including (but not limited to) doctor visits, durable medical equipment, lab tests, ambulance services, mental health care, and preventive services. Generally, most people will pay a monthly premium for Part B, which may vary from year to year and depend on your situation. Other costs related to your Medicare Part B coverage may include deductibles, copayments, and/or coinsurance costs. 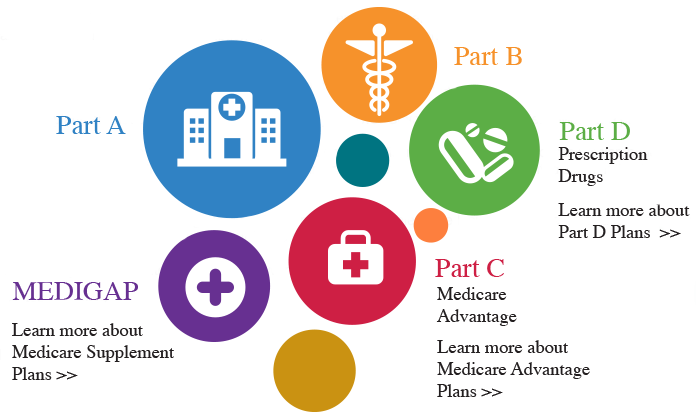 Once you’re enrolled in Part A and/or Part B, you may have other Medicare coverage options available to you, including Medicare Part C coverage (Medicare Advantage plans), Medicare Part D coverage (prescription drug benefits), and Medicare Supplement insurance (also known as Medigap). Some of these Medicare plans work alongside Original Medicare, while other types (such as Medicare Advantage plans) are an alternative way to get your Original Medicare benefits. Original Medicare doesn’t cover everything. Combine hospital costs and doctor and outpatient care in one plan. Can include Part D prescription drug coverage. May include additional benefits such as dental, vision, hearing services and wellness programs. If you’re turning 65, you can enroll in a Medicare plan. You can enroll three months before the month you turn 65, the month of your birthday or three months after. If you wait to enroll in a plan after this time, you may have to pay more. To sign up for Medicare Parts A and/or B contact your local Social Security office. If your health care needs change over time, so will the health plans you want to choose. You’re not locked in to one plan permanently. You’ll have an opportunity to change plans at least once a year during the Medicare Open Enrollment Period (October 15 – December 7). Keep in mind there may be limitations to rejoining a Medicare employer-sponsored plan.